We want to thank Elaine Schaefer Hudson for showing her work in our Sacramento office. One particular piece has captivated us and is titled "Journey - The Map of My Grief". Truly, a beautiful piece that resonates with us and we wanted to share. 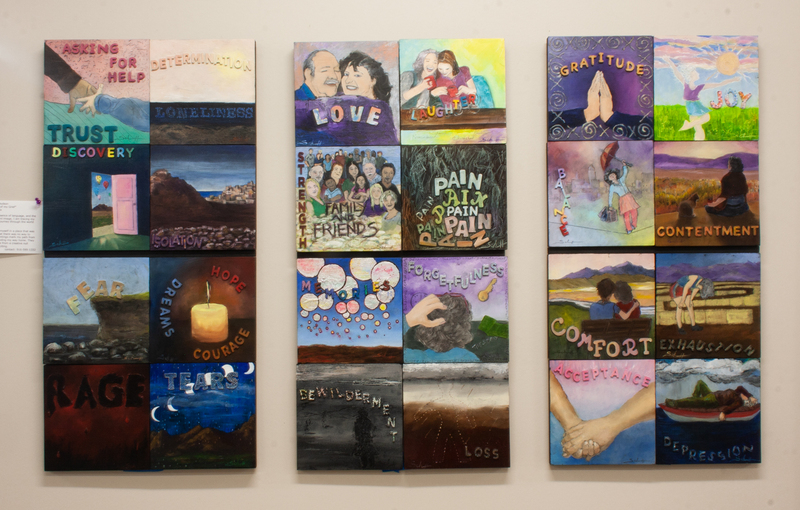 "Using both the physical presence of language, and the visceral blending of color and image, I am tracing my path of a deeply personal journey though the world of grief. As a recent widow, I found myself in a place that was so foreign, so unfamiliar, that there was no way to find my bearings. These paintings mark my path from one moment to the next, finding my way home. They also celebrate an emergence from a creative null zone: both daunting and exciting." Thank you Elaine and we hope you continue to stay strong on your personal journey.